With 6,000km of navigable waterways, the Netherlands offers one of the most extensive yet compact cruising grounds in Europe. This book is a user's guide to the whole network, covering all the mast-up routes and excluding only those waterways which offer less than 3.5m bridge height. Navigational details are provided for each waterway, comprising dimensions and obstacles to be expected, including service arrangements for bridges and locks. This is followed by details of over 300 stopping places across all 12 provinces; some which are large or popular harbours, and others which are well off the beaten track. Comments on the significant features are expanded for nearly 100 'principal venues' where more details on things to do and see are provided, as well as information on practical facilities ashore and the authors' selective and subjective restaurant tips! The book is designed to be of interest to all crew members, not just the skipper or navigator, whether its to establish how to approach a place, or to discover what to do or see of interest on arrival. Easy to browse, the book's illustrations have been selected to give a flavour of this water-loving country as well as to prepare the visiting yachtsman, whether under power or sail. This second edition has been updated with amendments to the text and maps. There are also many new photos by the authors. Louise Busby's interest in boating has led to commissions for Motor Boats Monthly as well as the Cruising Association's magazine. She is a former CA regional Almanac editor for the Netherlands and Belgium. David Broad is a detailed journal writer and log keeper, many of David's notes and sketches have been used in the compilation of this book. He is a Council member of the Cruising Association and the Chairman of the Broom Owners Club. 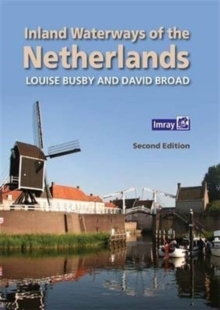 A website, which is a useful annexe to the book, is kept up to date with details of changes to the waterways along with useful links to further information.